The only son of Frederick Barrett and Sophia Field, he was born in Chesterfield, Derbyshire. The records show that for most of his life he was a printer and compositor. He worked as a sports writer with the Doncaster Gazette, and at the age of 65 as a 'reporter' in Manchester. 1841 Census shows John age 1 at home with mother and father; and half-brothers William Barber 8, & Thomas Barber 6; and Molly Barber, grandmother of the Barber boys. Molly's late husband had been an Excise Officer at Wakefield. 1861 Oct 5 John Henry 21 married Elizabeth Lowther 18 at Christ Church in the parish of Doncaster. The Certificate shows that John's father, Frederick was a printer and compositor; and Elizabeth's father George was a Fishmonger (and Game) dealer. Witnesses were Isaac Clark and Anne E Lamb. 1864 son, Frederick Lowther Barrett was born. 1865 Feb 18 "Yorkshire Gazette notice, apparently referring to the bankruptcy of father -in-law George Lowther, fishmonger established 15 years." 1866 son, William Wilkinson Barrett was born. 1868 daughter, Elizabeth Sophia Barrett was born. 1869 son, George John Barrett was born. 1870 The children's mother Elizabeth died age 28 - - they would have been 6, 4, 2, 6mo resp. 1875 He married Rebecca Gibson, nee Harrison, widow, landlady of the Cheshire Cheese public house. 1881 Cheshire Cheese public house, Doncaster, licensee / printer and compositor with wife Rebecca; the late Elizabeth's sons Frederick 17, William-Wilkinson 15, Elizabeth-Sophia 13, George-John 10 ; and Rebecca's children, Rosa-Susannah 3, Mary-Easter 1; John-Henry 6 months; and father Frederick Barrett 70 (retired printer). 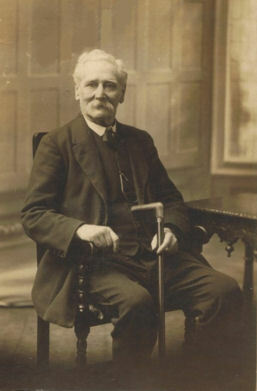 1891 Living at 36a Silver Street, Doncaster, printer and compositor, age 49. Premises adjacent to the St.Leger public house. Family at home as 1881, i.e. wife Elizabeth (aka Rebecca) 50, Rosa 14, Mary 11, John Henry 9; and father Frederick 81. 1901 Living at 14 Robert Street, Ardwick, Manchester, age 59, wife Elizabeth (aka Rebecca) 58; daughter Rosa 23 - - et al. John's daughter Mary 'Easter' Barrett (22) was an actress and resident in theatrical lodgings at 147, Radcliffe Road, Oldham, Manchester. 1919 the time of an infamous Spanish Flu epidemic - - - 3 deaths in 18 days. 1919 Feb 20 John's wife Rebecca Elizabeth Barrett died at 90 Cottenham Street, Chorlton-upon-Medlock (Ardwick), Manchester of influenza. 1919 Mar 4 John died also at 90 Cottenham Street just two weeks after Rebecca. John's death certificate indicates heart failure brought on by pneumonia. I suspect that influenza was also a factor.